ESPN first aired this movie on Dec 11th. While we were watching the movie at home, our family and friends would call and say " I saw you" But you have to look close, I had a very small role in a movie about Dale Earnhardt. We first knew about this movie from the internet. Some of the racing sites were posting the casting calls. One was held at the Concord Mall. When I arrived at the casting call, I was an hour early and there were maybe 100 people in line. When the interviews actually started the line was completely out into the parking lot of the mall. After the interview, we were told that if they needed us they would call within a week. The days slowly went by, and the phone rang. I was told that I was cast as a track offical and maybe pit crew. The casting agent was Tona Dahlquist. She also took care of the casting for Radio, Forrest Gump, The Program, That Darn Cat, along with the Nutty Professor II and more. The movie was filmed in a total of 21 days. A number of us were dressed in white uniforms while working the red dirt clay track in Lincoln County, NC. We would start at 7:30 in the morning. Actually had to go through makeup. They were not trying to clean us up, they wanted us dirty. Makeup consisted of black and brown powder, later a guy walked by with a bucket of mud and a paint brush. Those nice new white uniforms were no longer white. Most of us didn't know what to expect. The first day seemed extremely long. The wait was an hour or more between filming. When the actual filming would start, the director would say "That's perfect, lets do it again" and the same scene would be filmed over and over. Quite a few who were cast as extras in this movie were leaving, as the days went by. One of my favorite dirt track memories was a scene after a race where one of the drivers had words with Dale. During the scene, I was suppose to walk by. As I watched and got into the script, I heard "Cut" I looked up and one of the co-directors was waving their hands. They told me, were were trying to get your attention. They wanted me to walk by, but I was watching the movie. The directors told me "You'll have to wait for the movie to come out before you can watch it. The story is well written. Some scenes stand out. 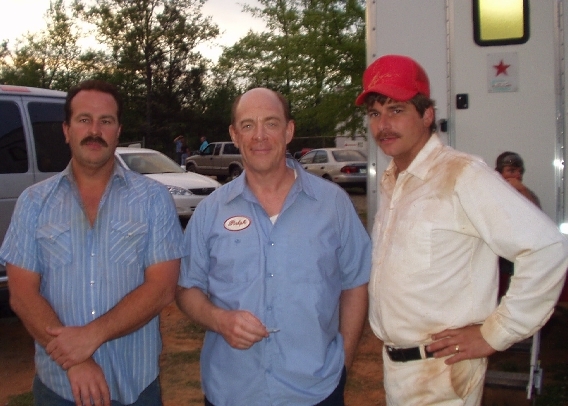 There is one were the guy kicks the car and has words with Ralph Earnhardt ( JK Simmons ). This was funny to watch. Every time it was shot, his kicks got less and less hard. When the scene was completed, the actor had a limp for several days. Being short on extras, we changed roles a number of times. A number of us would later be dressed as fans. They tried to make everything actual. In the early scenes, everyone had to be more clean cut. In the later scenes the people in wardrobe were constantly checking everyone. I even have a picture where they are cutting the tag off of my Levis. Some of the more obvious things that they were looking for and trying to keep out of the film, were sunglasses, cell phones, hats and shirts with logos. The main actors in this film were down to earth and real. They told us they had to step in front of the camera with a strong idea of their character. Everyone was great. And working with Barry Pepper was a rewarding and fun experience. Elizabeth Mitchell who played Teresa Earnhardt was also great to work with, along with JK Simmons. They all took time to talk, and take pictures. After the dirt track scenes were filmed, some of us had a few days off. When called back, we were at Rockingham. Originally, the plan was to go to Atlanta, but Rockingham was repainted to look like Daytona. Barry Pepper who played Dale Earnhardt had no racing experience, so they trained him. Barry seemed to have some trouble with the clutch. After the Daytona 500 win, there's a scene where Dale is driving down pit lane and all the other teams are giving him the high five. During this scene, Barry Pepper actually burnt the clutch up. The car was actually being pushed throughout that scene. I show up here and there throughout the movie, but show up the best during the Daytona 500 race as Earnhardts pit crew. After the pit stop, I can be seen right next to Ron Prather who plays Richard Childress. Once again, a very small role in such a great film.